C and I were at the Power Plant Mall recently, and we happened to walk by the kiosk of Joyce Aragon selling various foodstuff like cookies, spreads, bottled Dulong etc. One particular item caught our attention; they were flat, light yellow and looked really crunchy. 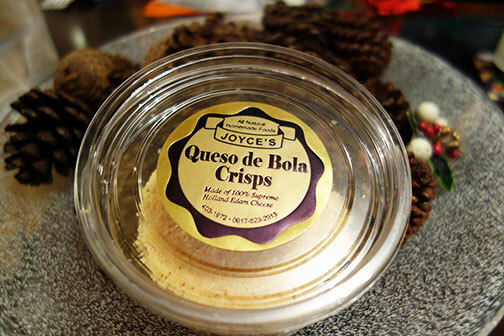 Yes Queso De Bola Crisps. I asked to try a sample and I was blown away by the texture and flavors of these little pieces of cheesy wonder. They were so good, that I bought a bottle to take home right away. Later on, I met Joyce in the flesh and I asked her about the crisps. She said that they were inspired by the Parmesan Crisps that she had on her trips to the U.S. She experimented with various ingredients, but found that her version of crisps were best made with 100% Queso de Bola or Dutch Edam Cheese and nothing else. 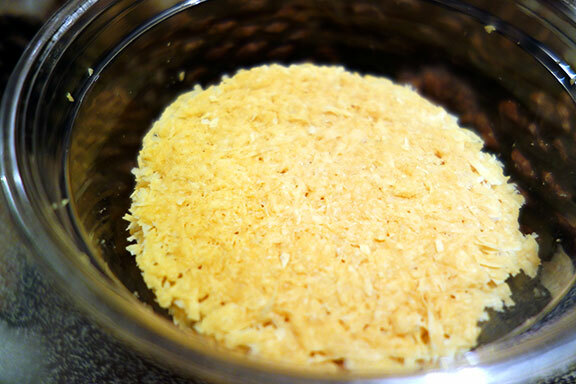 Finely grated Edam baked until they are crisp. A bite will bring out the cheese lover in you to the fore. I have had those Parmesan Crisps from the US that Joyce was talking about. I think that her version blows those out of the water. One can eat them on their own, with a wee dollop of tart fruit chutneys like quince or raspberry, or even as crunchy topping to a Caesar or Chef’s Salad. Since these crisps have no added ingredients, they are also gluten free. Think of them as slices of Queso de Bola that have somehow metamorphosed into crunchy form. As James Bond would say: Nice, very nice! Hi Jin, Good idea on the pasalubong! See you soon. Thanks for stopping by!